In case you are heading out to go shopping this weekend, don't forget to check out some of the latest coupon offerings to get the most out of your money! Here is a new one...free President's Day printables! It's never too early to teach your children about our Presidents and our nations history. Click HERE for free printables, activities, and games from familyeducation.com. Click HERE for free printables, crafts, activities, and games from kaboose.com. Click HERE for free printables, coloring pages, worksheets, unit studies and more from homeschoolhelperoline.com. Click HERE for free coloring pages from apples4theteacher.com. Click HERE for free George Washington printables from homeschooling.about.com. Click HERE for free coloring pages worksheets of the Presidents of the United States from homeschooling.about.com. Did you get to check out this story on Good Morning America this morning? It is really scary to know that you try your best to make healthy choices and you are still not safe. Below is an article about dangerous levels of arsnic found in products using organic brown rice syrup. "If you're shopping organic and see brown rice syrup listed first among ingredients, you may want to think twice: That product could have high levels of potentially toxic arsenic, Dartmouth researchers reported today. A team led by environmental chemist Brian P. Jackson found what Jackson called dangerous amounts of arsenic in organic powdered infant formula whose top ingredient was brown rice syrup. That formula contained six times more arsenic than the Environmental Protection Agency considers safe for the water supply. Jackson and his colleagues also reported elevated arsenic levels in some brown rice-sweetened cereal bars, energy bars and energy "shots"consumed by endurance athletes, according to a study published today in the journal Environmental Health Perspectives.The results, which do not identify any products by name, follow recent reports about trace levels of arsenic in apple juice and previous reports of arsenic in rice. Given that organic brown rice syrup "may introduce significant concentrations of arsenic to an individual's diet," the researchers saw "an urgent need for regulatory limits on arsenic in food." Dietary sources of arsenic represent "potentially a big public health issue that has not been taken on board," Jackson told ABCNews.com. The Food and Drug Administration has been sampling and testing a variety of "more conventional" rice products, including rice crackers and rice cereals, "to evaluate what the risk is and what the levels are in these products" said Siobhan DeLancey, a spokeswoman for the agency's Center for Food Safety and Applied Nutrition. Depending on what the testing reveals, she said there was "a possibility" that the agency would set a threshold for arsenic levels in rice. The FDA previously set a "level of concern" of 23 parts per billion of arsenic for fruit juices, the only other food to have such a designated level. The EPA standard for arsenic in drinking water is 10 ppb. "The bottom line is this shows there's a need for FDA to figure out some limits on this and put that out there," said Patty Lovera, assistant director of Food and Water Watch, a consumer advocacy group in Washington, D.C. She said FDA needs to take a broader approach toward arsenic in what we eat, rather than going "food by food." "There's been quite a lot of press on arsenic in rice in the past six years, but less so on the rice products," Jackson told ABCNews.com. As Americans consume more rice-containing foods, they're unknowingly ingesting more arsenic, he cautioned. He pointed out that they're buying more organic packaged foods, more gluten-free products made from rice instead of wheat flour, and choosing foods sweetened with organic brown rice syrup because of the buzz they've heard linking high-fructose corn syrup and obesity. But they're frequently unaware that many of these foods contain rice. "Even if you were an educated consumer, some products might just creep under the radar," Jackson said in an interview Wednesday. The maker of organic baby formula with brown rice syrup probably "has the best of intentions. They're trying to produce a baby formula people want to buy," Jackson said. Jackson said he originally was studying arsenic levels in major brands of baby formulas, but even those made with rice starch were low. However, two organic baby formulas (one milk-based, the other soy-based) made with brown rice syrup had 20 to 30 times more arsenic than the other formulas. That sparked his interest in broader testing of packaged organic foods with and without brown rice syrup, purchased from local supermarket aisles in Hanover, N.H. The researchers tested infant formulas, cereal bars, energy bars and energy "shots," which are gels consumed by endurance athletes. Arsenic occurs in several forms, some thought to be more dangerous than others. Organic forms of arsenic can be found naturally in the soil, along with arsenic-based pesticides used before the EPA banned them in 2009. Rice, Jackson noted, "takes up more arsenic than all the other grains." Inorganic arsenic is considered much more toxic than organic arsenic, Jackson said. Brown rice is usually higher in total arsenic and inorganic arsenic than white rice because the outer layer that's removed in white rice contains the inorganic arsenic. However, another form of arsenic can be found inside the grain of both white and brown rice. The EPA drinking water standard is 10 parts per billion for total arsenic, which combines inorganic and organic arsenic. Jackson's team tested one package of soy-based baby formula made with organic brown rice syrup and found a total arsenic level of 60 ppb, including about 25 ppb of inorganic arsenic. That kind of level is dangerous, given babies' small size and developing bodies, they said. Given the variety of formula brands available, he said, "I would choose one that wasn't based on organic brown rice syrup." They also detected arsenic levels ranging from 23 to 128 ppb in cereal bars made with brown rice syrup; and levels of 84 to 171 ppb in three flavors of energy shots. "I don't necessarily think eating a cereal bar every couple of days is a health risk," said Jackson, who collaborated on the study with researchers at Dartmouth's Children's Environmental Health and Disease Prevention Center, which is funded by the EPA and National Institute of Environmental Health Sciences. "But we don't have any guidelines for maximum allowable amounts in food or the cumulative amount of arsenic intake during the day." "There's no perfect advice," Lovera said. "There's no one thing people can do." But she said, the surprising presence of arsenic in packaged foods give people a chance to ask themselves, "How many foods do I need to eat that are processed with ingredients I don't really know that much about?" Here are some new coupon deals! Hurry and print before they run out. Valentine's Day is today! It's not too late to print off some free Valentine's Day printables for your kids to create, color and give out to their loved ones. Click HERE for free printable cards, coloring pages, activity sheets, gifts, stickers, and decorations from familyfun.go.com. Just in case you haven't noticed, we have a new Blog design! I just wanted to take a minute to thank Nicole at Techmomogy Designs for an incredible job redesigning the Blog! 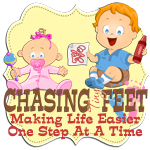 I hope that you will be better able to find posts easier and have a better overall experience on Chasing Tiny Feet.